The Stockton Assembly Center was at the San Joaquin County Fairgrounds. Occupied for 161 days from May 10 to October 17, it held a total of 4,390 evacuees from San Joaquin County, with a maximum population at one time of 4,271. 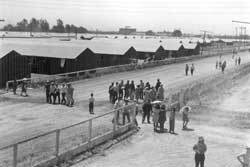 In the racetrack infield there were 125 barracks and another 40 barracks were on the east side of the fairgrounds (Figures 16.55 and 16.56). Figure 16.55. 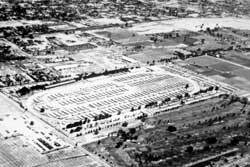 Oblique aerial view of the Stockton Assembly Center. Figure 16.56. Stockton Assembly Center. No assembly center or fairground buildings visible in the 1942 aerial photograph remain, but many of the residences and businesses in the vicinity are still present. 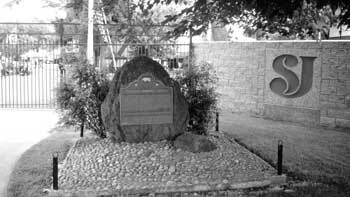 There is a State of California historical marker at the main pedestrian entrance of the fairgrounds (Figure 16.57). Figure 16.57. Historical marker at the entrance to the San Joaquin County Fairgrounds in Stockton.